Located in the heart of the Urals is the city of Yekaterinburg, the world’s largest “open air constructivist museum.” Yekaterinburg is home to a rich collection of monuments to constructivism, the innovative architectural style popular during the 1930s Soviet industrial boom. Eighty years ago, the Ural industrial giant, named Sverdlovsk at the time, was very prosperous. Considering it to be a “city of the future,” the government transformed Sverdlovsk into an industrial center. However, the city became an embodiment of the innovative architectural style that symbolized the new social structure. Leading Moscow and Leningrad architects, as well as German specialists from the Bauhaus School, were invited to create an avant-garde image for the megalopolis. They brought their boldest projects into fruition here. It is thought that there are only two cities in the world that can compete with Yekaterinburg’s daring, avant-garde architectural projects: Chandigarh in the north of India, built from new ground in the 1950s as part of a project by the famous French architect Le Corbusier, and the Brazilian capital Brasilia, built in the 1960s out of the jungles as part of a project by Oscar Niemeyer. But the constructivist Sverdlovsk was “raised up” almost three decades before avant-garde architecture became popular around the world. There are more than 140 buildings in the style of constructivism in the capital of the Urals. Thirty of them are located on the main city thoroughfare named after Lenin. Today we will talk about seven of the most famous masterpieces of this style. This is one of Yekaterinburg’s iconic sites. The White Tower, a 98-foot-tall structure reminiscent of a lighthouse, attracts many tourists. For a long time the “lighthouse” looked surreal, because it was surrounded by pine forests. 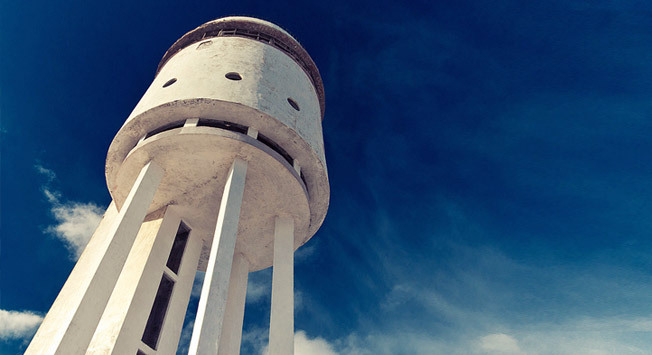 Its official name is the Ural Heavy Machinery Factory Water Tower. At the time of construction, it was the largest water tank in the world (185,000 gallons). The contest to determine the tower’s design was won by Moses Reischer, a 25-year-old graduate of the Siberian Technological Institute. At the moment of its creation in 1931, the tower symbolized a new era at the dawn of Soviet building – the concrete era. Ðdress: Bakinskikh Komissarov (Baku Commissars), 2a, at the extension of Donbass St.
A mysterious place without which it would be impossible to imagine Yekaterinburg, The Little City of the Chekists was designed for the residence of NKVD commanding officers and symbolized the “city of the future.” At the dawn of the Soviet era it was surrounded by low wooden structures. The living quarters were 4.1 hectares and included 14 various buildings: housing blocks, a guest dormitory, a laundry, an administrative building, a three-story nursery, a kindergarten, a polyclinic with a pharmacy and hospital, and a Palace of Culture (in which the Museum of History and Archaeology is located today). The entire complex was surrounded by a high fence and guarded around the clock. A group of architects helped design the building, which was completed in 1934. By the standards of that time, the Little City of the Chekists was an elite area in the center of the city, with large separate apartments and a closed yard. It was in this very building that the first telephones appeared and the electric and water supplies worked without interruption. But there were no kitchens or stoves in the apartments: everyone ate in a common cafeteria, washed clothes at the common laundry, and bathed in the common bath. Today, the “Little City of the Chekists” has turned into a regular city area, but it is still surrounded by sinister legends. It is believed that there are lots of underground tunnels located underneath it, the purpose of which is still classified, and that by using them you can get to any point in the city. Until 1848, it is rumoured, this place was a graveyard. The complex as a whole has been entered into the register as a shining example of Soviet Constructivism, but the building with the wooden beams has not been renovated once over the past 80 years. The Iset Hotel is part of the Little City of the Chekists. The eleven-story building was built as a dormitory for young NKVD workers and is now one of Yekaterinburg’s largest hotels (three stars). The unique semi-cylindrical building reminds the viewer of a horseshoe or sickle. At one time it was the architectural symbol of Sverdlovsk printed on New Year’s cards, and in 1937 a stamp was issued in Spain with its image on it as a model for socialist living complexes. Built in the constructivist style by a group of Soviet architects in the 1930s, this is the largest administrative building in the Sverdlovsk region. The CPSU Regional Committee and Regional Executive Committee were located here until 1982. It was in this very building that the first president of the Russian Federation, Boris Yeltsin, started his political career. The building, from which officials governed the region for many years, looks as if it was made of children’s toy building components: cubes, cylinders, and corners. On the opposite side, in the center of a smallish square, there is a round marble fountain called Stone Flower that was built in 1960. On each even flower petal there is a five-pointed Soviet star and on each odd one there is a hammer and sickle (the state emblem of the USSR, the symbol of the unity of workers and peasants). Now various enterprises are located in the former House, including the tax service and arbitrage court. The building is found in a familiar place. The oldest square in the city, Labor Square, is located very close to the Council House; to the left, only a few dozen meters away, is the monument to the founders of the city Vasily Tatishchev and Wilhelm de Gennin (which some of the city’s denizens call Beavis and Butthead); down the stairs is the Iset River Dam, the historical center of the city; there also is one of the oldest structures, the Waterfall Tower, built in the 1880s and preserved in its original form down to this day (there is a museum-smithy now located in it). This is one of the most famous examples of constructivism in the world – and one of the most romantic. It reminds one of a docked ship and is located on the City Pond waterfront next to the picturesque square. The oldest sports complex in the city, it was built in 1934 under the guidance of the architect Benjamin Sokolov and has been used for its original purpose throughout the 80 years of its existence. As before, it is a sports mini-city where hundreds of sportsmen and amateur athletes practice every day. This building can be recognized by the airplane on its roof: a model PO-2 was set up here first (the PO-2 is one of the best domestic airplanes of the 1930s, capable of correcting the blunders of a pilot, getting out of a spin easily, and landing on practically any field) and now there is a sportive YAK-50 (a Soviet training aircraft). Built in 1934 as a project of the architect Giorgi Valenkov, it is the largest military-sports complex of the city and was designed to accommodate athletes and trainees of the Society of Assistance to Defense and Aviation-Chemical Construction. The Defense House is on the intersection of Malyshev St. and 8 March St., at the site of a busy market not far from the Church of the Holy Martyr Maximilian which was demolished in 1930. It is a historical monument of regional importance. Ðdress: 31 D Malyshev St.
Or as the people say – the Tractor House, since the House of Communications looks like that particular agricultural tool from a certain point of view. The eight-story building shaped like a three-sided square appeared in the center of Sverdlovsk where two merchants’ estates had been. The telegraph office, a separate post office, and an intercity telephone station were situated here. And by the project of the Moscow architect Konstantin Solomonov, an 800-seat radio theatre, studios, a kindergarten, a nursery, and various clubs were also provided for. Today the building houses the main post office. Several yards from the entrance is a “zero kilometer,” a metal symbol marking the geographical center of the city. From this point, distances can be measured to various cities, for instance, from Yekaterinburg to Moscow, Paris, or London. This central point is considered lucky. Locals believe that if you stand perfectly in the center of the circle, make a wish and throw a coin across your left shoulder, it will come true without fail. This was the calling card of socialist Sverdlovsk – the dark orange four-story building with ribbon windows extends the entire length of a block and a rounded corner over the central entrance. Sverdlovsk’s chief architect, Giorgi Golubev, developed the project for the Uralsky Rabochy (Ural Worker), the largest newspaper and publishing house in the Urals. The building was constructed in 1934. During World War II it served as the literary center for evacuated writers. Agnia Barto, Lev Kassil, Marietta Shaginyan and other masters of literature worked here. Not long ago, the legendary printing house was forced to move to a different building and a large part of the freed space remains empty. The Press House is adjacent to the Theatre of Musical Comedy from the west and to a residential building that it shares an arch with from the east. There is a courtyard is in the back of the lot. This is a monument of federal importance.